CoolIT Systems announced the OMNI N590, a liquid cooling solution for the GeForce GTX 590. CoolIT Systems™, the leader in advanced liquid cooling technology, announced today the launch of the OMNI™ N590 A.L.C. cooler for NVIDIA® GeForce® GTX 590-based graphics cards. The release of this solution will enable trend setting system integrators to solve thermal and acoustic challenges in top-of-the-line PCs, allowing them to deliver a more robust NVIDIA Quad SLI™ solution to their customers. 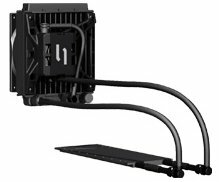 The CoolIT OMNI A.L.C., winner of the 2010 CES Innovations Design & Engineering Showcase Award, is the world's first universally designed self-contained liquid cooling system for graphics cards. "We have no doubt that our OMNI N590 will be an extremely successful product for us and our system builder partners," says Barry Fairhurst, Vice President of Worldwide Sales, Marketing and Services. "Leveraging off our success with OMNI N480 and N580, OMNI N590 will continue to ensure our leadership position in liquid cooling for enthusiast graphic cards." Further backed by CoolIT's expertise in custom development, the OMNI can be tailored to meet system integrator requirements so that their OMNI solution is as unique as the polished powerhouse PC's they deliver to customers. Built to these exacting specifications and paired with NVIDIA's fastest graphics card ever, the GeForce GTX 590, OMNI N590 can deliver up to 30°C lower GPU operating temperatures* while minimizing acoustics. "We are excited about the OMNI N590 as it makes the world's fastest graphics card, even better," said Drew Henry, general manager of the GeForce business unit at NVIDIA. "PC enthusiasts now have the best components available to build out the fastest, quietest, and coolest gaming rigs ever imagined." The CoolIT OMNI N590 is immediately available from select premier system integrators including MAINGEAR, Falcon Northwest and Puget Systems as part of a complete system.